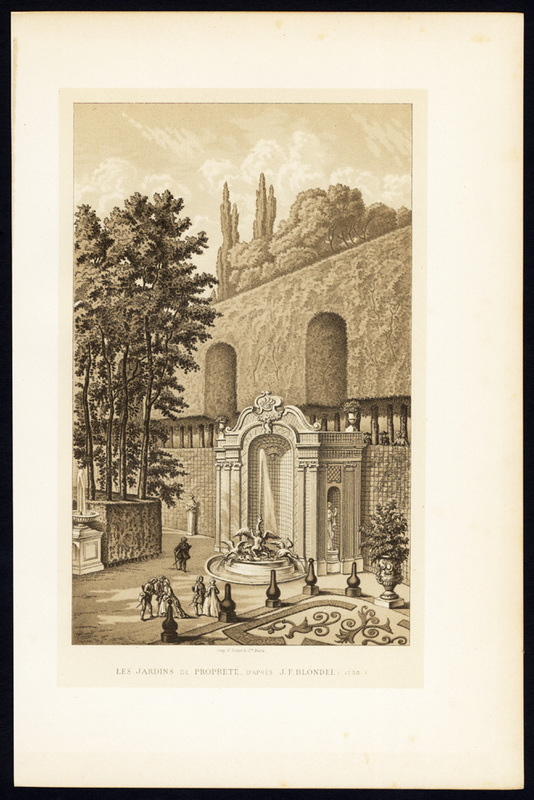 Subject: Plate: 'Les Jardins de Proprete, d'apres J. F. Blondel.' (The gardens of purity, after Blondel 1738). Jacques-Francois Blondel (1705 - 1774), French architect. Condition: Excellent given its age. General age related toning and occasional light staining / foxing. Please study scan carefully. Medium: Original colour chromolithographs on a vellin type paper. Size (in cm): The overall size is ca. 18 x 28 cm. The image size is ca. 13 x 21.5 cm. Size (in inch): The overall size is ca. 7.1 x 11 inch. The image size is ca. 5.1 x 8.5 inch. Description: This attractive original old antique print / plate originates from: 'XVIIIme Siecle. Lettres Sciences et Arts. France 1700-1789.' (Science and art of France during the 18th c. until 1789). ), by Paul Lacroix, published in Paris by Firmin-Didot et Cie., 1878. Artists and Engravers: Paul Lacroix (1806-1884), French author and journalist. He is best known under his pseudonym of P.L. Jacob, bibliophile, or Bibliophile Jacob.